Article by Alison Wells © 5 February 2018. 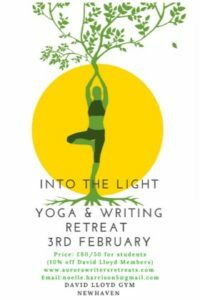 Writing.ie recently featured an article on the Into the Light Creative Writing Yoga Retreat, in which participants explored the relationship between yoga and creativity – specifically creative writing. Isn’t that what everyone expects me to say? Critics of retreats and events are either totally enamoured by what they experienced or completely disappointed and let down. Well I’m on the A-plus bus for this event. If you were a sceptic and thought that opening up your blockages – of the creative kind – through some mumbo-jumbo stretching and meditation was all hoodoo hogwash, you’d literally be eating your words after a session with Noelle Harrison and Vanessa Rigby. They opened us all up and we were a diverse bunch. A keen and eager class of quiet and retired types, confident and vociferous types intermingled with the “I can do the yoga part but not sure about my writing” and the “Keep your mat just give me a pen”. And yet the two hostesses deftly spun their magic web of inspiration and draped it beautifully over all of us, coaxing us out of our invisible cocoons through gentle asanas followed by guided writing exercises to open up the “ink” gates. I was among the sceptics. Nonetheless I attended with great keenness and curiosity as I adore Noelle’s page-turning stories and am happily familiar with the bag of tricks yoga offers with its postures and breathing – I’m not sure it is appropriate to liken yoga to a bag of liquorice allsorts, but you never know what you’re going to get next. When first introduced to yoga it saved me from a fatalistic relationship of oppression and addictions, since then it has continued to be my crutch. 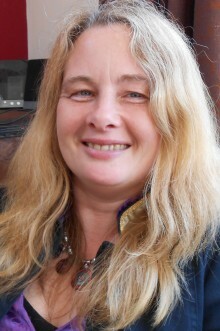 At the Aurora Writers Retreats (www.aurorawritersretreats.com) event it become my doorway to enlightenment. Its bag of tricks filling all the time like Santa’s mysterious red sack of delights. Without giving too much away of Noelle and Vanessa’s programme, I will relay one brief example that blew my mind – literally straight out onto my page (sorry that was a bit graphic!). After a series of opening and relaxing poses combined with the ever-present awareness of our breath with Vanessa, Noelle seamlessly took over guiding us on an unexpected journey through our imagination, which culminated in a world of colour. We then harnessed this colour, using it as a fuel to propel our creative spirit forward onto the page. The creation that sprung forth from my unexpected pool of purple resembled nothing I had ever written before. It was poignant, subtle, suggestive, compelling and forceful. I was so impressed that I was a little anxious to try the exercise again in case it should not yield such fruitful results a second time. Yes, I am one of those who shies away from success by nature. But I know that the ladies at the retreat would be there as a virtual netting should I fall from grace to fill me with encouragement and inspiration once more. After a day at the Imbolc writing retreat hosted at the fabulous David Lloyd Gym in Newhaven in Edinburgh, I am adorned with the armour of my intrepid warrior self, the peaceful warrior and the creative warrior. No longer shall I walk this journey of literary and creative discovery on my own. No longer shall I be the lackey of self-doubt and trepidation. With my new literary companions from Aurora Writers’ Retreats forever by my side, fuelling me with the memories of an unforgettable and powerful session and a connectivity that stretches from Harrogate to Scotland, across to Norway and around the world, bringing together women who all have a bloody good story to tell, I shall shout my message from the Peak of Mount Tweet and the Valley of FB: embrace the power of yoga, unlock the door to your secret treasures. A special mention must also be given to the David Lloyd Club in Edinburgh whose service lacked for nothing and whose warm hospitality was welcoming.